About the Author: Sudhakar Kumar from Shri Mata Vaishno Devi University, Katra shares how he managed to get an international internship of his dreams in the 2nd attempt. 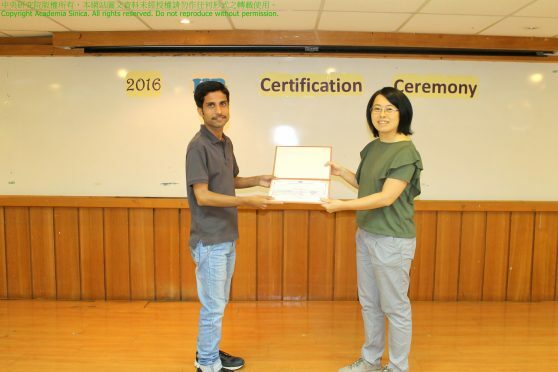 It was a shivering cold night on January 3, 2016 at Shri Mata Vaishno Devi University Katra, when I found out that Academia Sinica (Taipei, Taiwan) had announced its 2016 cohort of international internship program (IIP) via Taiwan International Graduate Program (TIGP). In the very first place, it reminded me of my disappointment when I was rejected for the last version of the same program i.e. TIGP-IIP 2015. After overcoming the state of bewilderment, my conscience nudged me to try once more for this coveted program, which might culminate in fulfilling of my year-long cherished dream of participating in an international internship. Then, I recalled that the Research Center for Information Technology Innovation (CITI) and the Institute of Information Science (IIS) in Academia Sinica are the only two institutions, where the students majoring in Electronics & Communication Engineering could utilize their skills for carrying out research work (project). Accordingly, I emailed a few research fellows of these two institutes with dimmed hope of receiving affirmative response. On January 4, 2016, Dr Ronald Y. Chang (Research fellow, CITI) responded to my email, advising me to share my personal aspirations from this two months’ internship at TIGP-IIP. This email made my day, as I was not expecting such a pleasing and prompt response. Later, on January 11, I was asked to attend a Skype interview, which went very smooth and soothing, except the concluding statement – “Thanks for your time. I will let you know my decision.” With this, I felt apprehensive about my chances. However, the suspense didn’t last for long; as within 24 hours of the interview, Dr Chang rendered his kind consent to support my candidacy. Finally, on April 1, I got to know that I had been shortlisted for the July-August batch of TIGP-IIP 2016. The preparation for the two months’ (July 1 – August 31, 2016) sojourn in Taipei (the capital of Taiwan) was itself enthralling. After a rush of two weeks, I managed to obtain the visitor visa and landed in Taipei on June 30, 2016 in a connecting flight from Kolkata (with transit in Bangkok). During the internship, my boss (this is what students call their mentors or supervisors in Taiwan) Dr Chang taught me the rudiments of research like how to select a paper or article for developing an insight, in what way we should select a confined and focused topic for our own research i.e. problem pitching etc. The observations were reported to him in form of weekly reports and regular Monday meetings, which were indispensable for developing my own research interest(s). These discussions empowered me to keep abreast of the trending topics in wireless communications like Mobile Social Networking, Wireless Power Transfer etc. Most importantly, I was engrossed by the vast usage of mathematical modelling and further optimization of research problems at Academia Sinica. Also, Dr Chang made me aware of the sincere intentions of researchers behind publishing papers. Based on the learning and initial rectification suggested by my boss, I could propose an efficient path optimization of wireless charging vehicles for an Internet of Things (IoT) network. The excursions to various places like Taipei 101, National Palace Museum, National Central University, etc. testified the rich and varied heritage of Taiwan. First and foremost, I was astounded by the Taiwan’s no dustbin approach for maintaining cleanliness. Furthermore, it was surprising, when I realized the prevalent 4G Internet access over there because the developing countries across the globe are still getting by with 3G. When it comes to conveyance, the train services i.e. High Speed Rail (HSR), railway (TRA) and Metro (MRT, with no security check at the entrance) and public bus facilities provide a pleasing journey to the commuters through Taiwan. During my stay, the only thing which perturbed me was the food, which had no spices altogether. It was initially tough (being a north Indian) to survive on the meals which had negligible amount of spices. Nonetheless, the weekend cooking in TIGP dormitories used to compensate for the (required) amount of spices’ level in my body. Moreover, the 24 hours’ services facilitated by the convenience stores like 7-Eleven and Hi-Life made lives easier especially for those who burn midnight oil. Apart from this, my roommate Julian (from Malaysia) used to identify the available supplements in the super markets, which were (quite) safe to consume even from my religious viewpoint. This internship fulfilled my long cherished wish of taking part in an international internship. Through TIGP-IIP, I could connect with people from quite a few countries and availed a unique exposure to research, which was essential for my aspiration of higher studies. The pleasurable company of persons around and absolutely new flavor of research in Taiwan didn’t grant a privilege to keep track of the days passing. The experience gained in the company of fellow interns from the world has been a life time achievement and the exposure earned through the erudition of Dr Chang would continue to be a milestone for my career prospects. Editor’s Note – Do you also want to travel abroad for your internship? Check out these exciting international internships on Internshala. How to become a blogger – Creating your own blog!